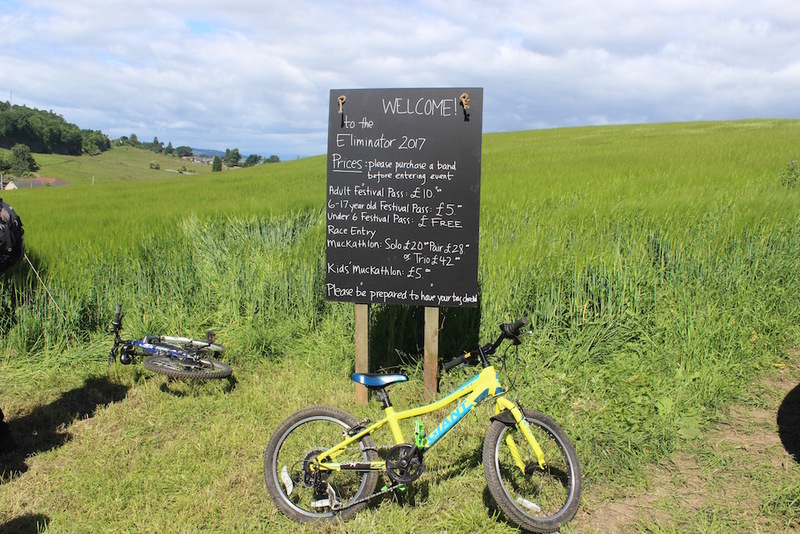 Enjoy Funky Ella's latest blog following our recent travel bloggers outdoor weekend in Fife. 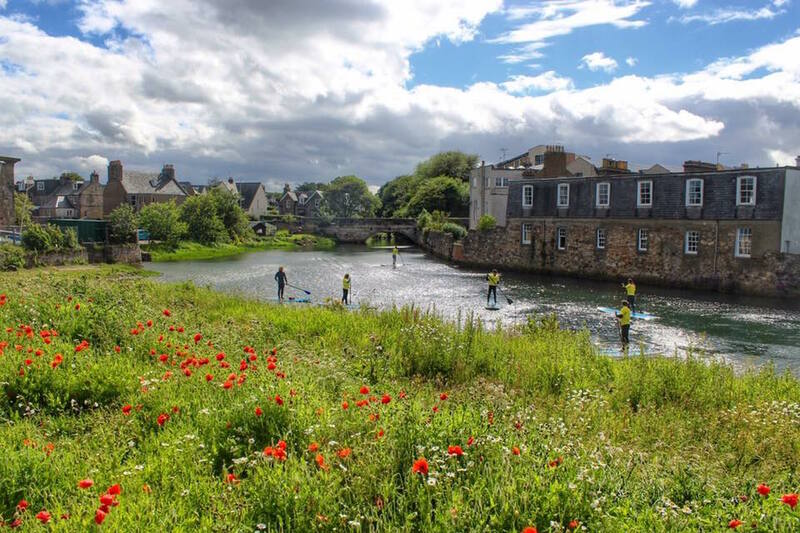 Did you know Fife has been voted No1 outdoor destination for the last eight years? 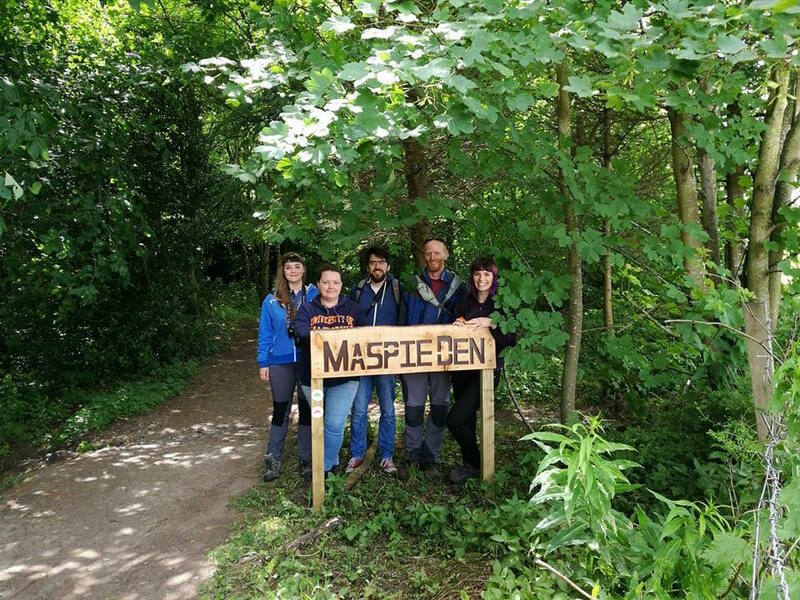 Welcome to Fife's latest bloggers trip let us explore the outdoors and see what the Kingdom really has to offer. We began our first day with a massive treat! 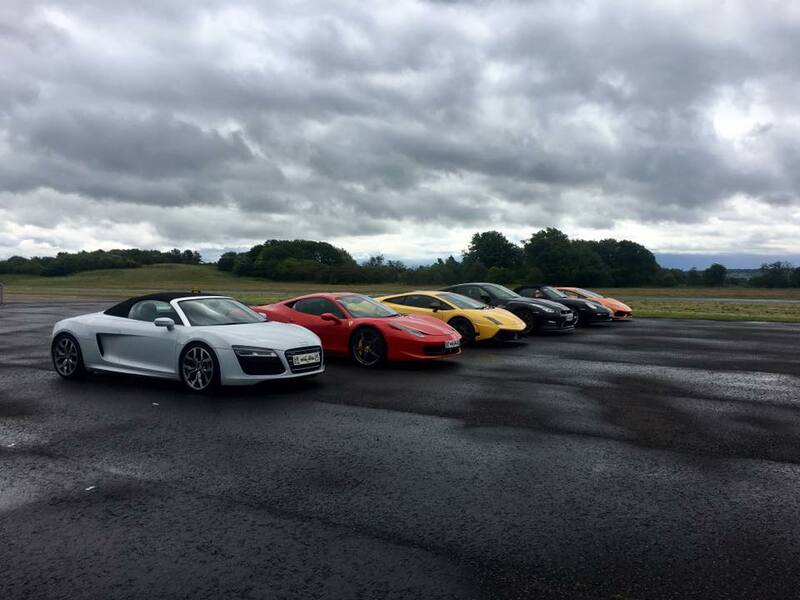 Supercar Test Drives bring their cars to Fife Airport regularly and it gives people the opportunity to drive a number of extremely impressive and expensive cars they would never be able to drive otherwise. You can take your pick from anything from Porsche Boxter or a Nissan GTR to a Ferrari 458 Italia or a Lamborghini Gallardo. For a small additional cost you can upgrade to a Lamborghini Hurakan, which is the beauty I got to drive. Never did I think I'd see the day. After a chat with the team about what was involved we were taken to the track for an instruction lap in a normal car before we took to the wheel ourselves. After an unglamorous and not very lady-like entrance (these cars are low!) I tentatively drove off and was soon encouraged to put "pedal to metal". What an adrenaline rush! We also figured out you don't need a driving license and you can even drive from the age of 12 so, if you're looking for a present for your teenager, you'll be their best friend forever with this!! 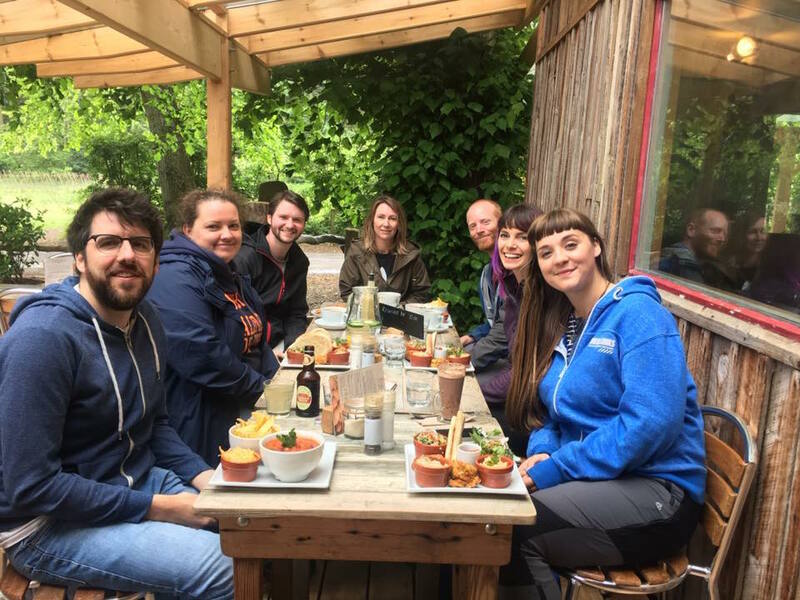 Everyone was in serious need of a coffee and bite to eat, and perhaps a chance to get our breath back after the drive, so we headed along to Pillars of Hercules. This meat free and organic farm has expanded beautifully to include a well-stocked farm shop, cafe and campsite. We had a stunning lunch outside on the wooden decking. I loved the meze platter with homemade humous, chilli jam and baba ganoush, served with warm pitta breads and salad grown on site. I actually came here on the Fife food blogger trip for a vegetarian breakfast and I can honestly say it's one of my favourite places to eat in Fife. I enjoy not just the food, but the rustic feel, comfortable atmosphere and the off grid location. We got a tour of the farm afterwards where we explored the polytunnels filled with veg and herbs and flowers. Joining us for lunch was Ben Dolphin, the "nature but" as he is became known. Living in the surrounding Lomond Hills he knows the area like the back of his hand and he took us off on a hike to nearby Maspie Den. I've heard of this a few times but never visited so I was thrilled to be able to see it, and walk under the spectacular waterfall. Fife really does have some amazing walks, you just have to get out and find them. 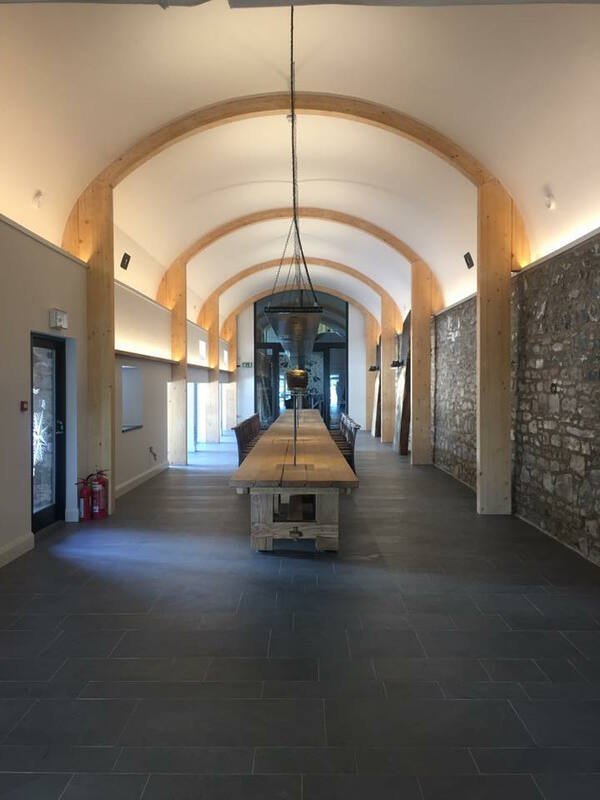 We ended the day with another fantastic treat, a behind the scenes tour of the yet-to-open Lindores Abbey Distillery. What an absolute gem and it's sure to be a great addition to tourism in Fife when it opens in August. 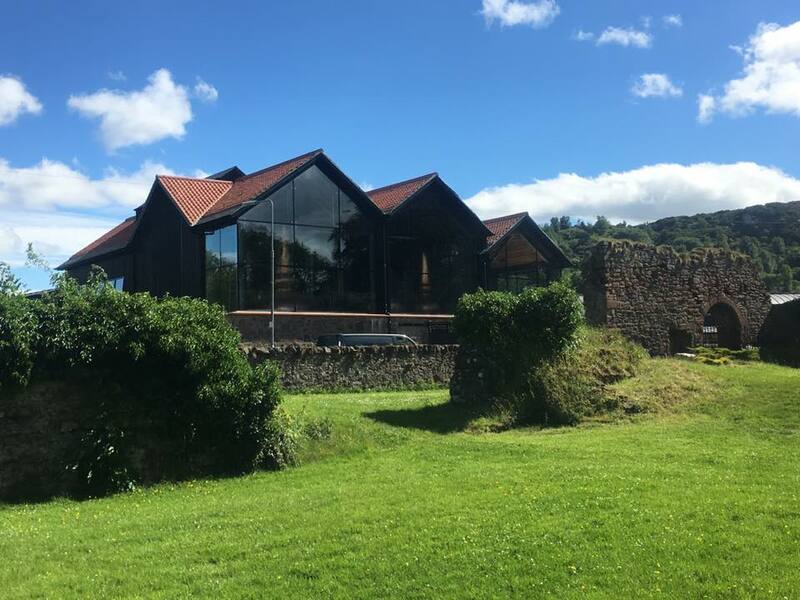 I love a well-designed building and the genius behind the design of this distillery has done a fantastic job. The walls are a deep red and cream and long oak tables and benches fill the spaces. Rooms that will be perfect for events branch out from the main entrance. A well thought out history of the building displayed on the walls reminds visitors that the earliest mention of scotch whisky was here in the Abbey. Original stones found on the site are displayed along the walls of the long central hall, which has the longest oak table I've ever seen! Owner Drew McKenzie Smith, the "Custodian of Lindores" took over the site from his grandfather who bought it in 1913. After his wife Helen showed us around we were taken to indulge in afternoon tea in their home and we also got to meet the cutest little kittens you ever did meet. The two will be the mice catchers, but just now they are tiny little balls of fur that are bundles of fun. So while we played with them, we ate dainty sandwiches filled with salmon, small wraps with coronation chicken and enjoyed a lovely selection of scones and cakes made by their head chef. 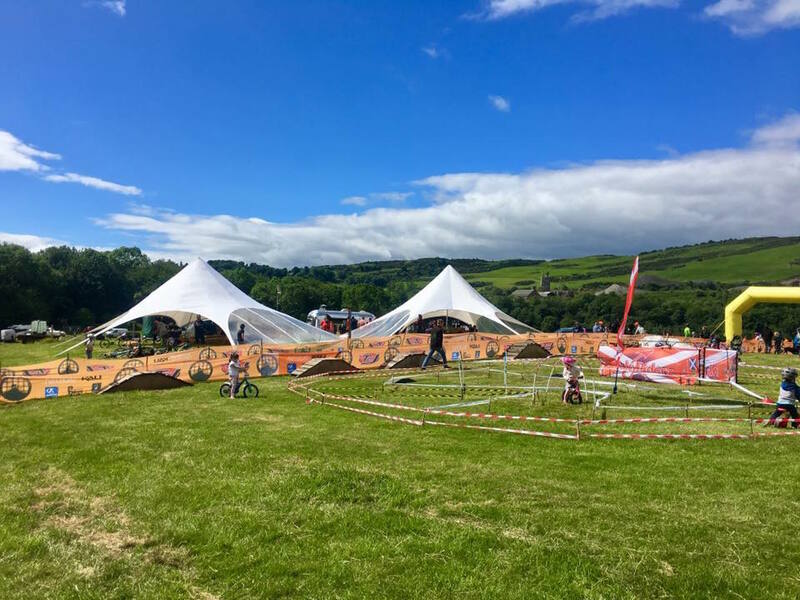 Our second day began at the Muckmedden Mountain Bike Festival where we watched mountain bikers of all ages race through the forest tracks. Little tots cycled over mini obstacle courses and older kids competed over a tougher track. Not a biker myself I could still see the appeal; it was a proper family event. Haybales under marquees were filled with groups eating butties waiting for the main event - the Head2Head. Kids were rolling around in the bales, cycling with their friends and climbing on the climbing wall. Families slept on site in luxury bell tents and camper vans and it was a lovely, happy atmosphere. With a farmers market, delicious food, live music, a giant water slide, circus workshops and a beer festival, there really was something for everyone and we spent the morning relaxing in the sunshine and soaking up the happy vibes at what is the "highlight of the Scottish racing Calendar". Feeling chilled out, Gary (from Edinbraw) and I drove to St Andrews to meet up with Jenni from The Thrifty Magpies Nest and Chelsea from Loving Life in Wellies. 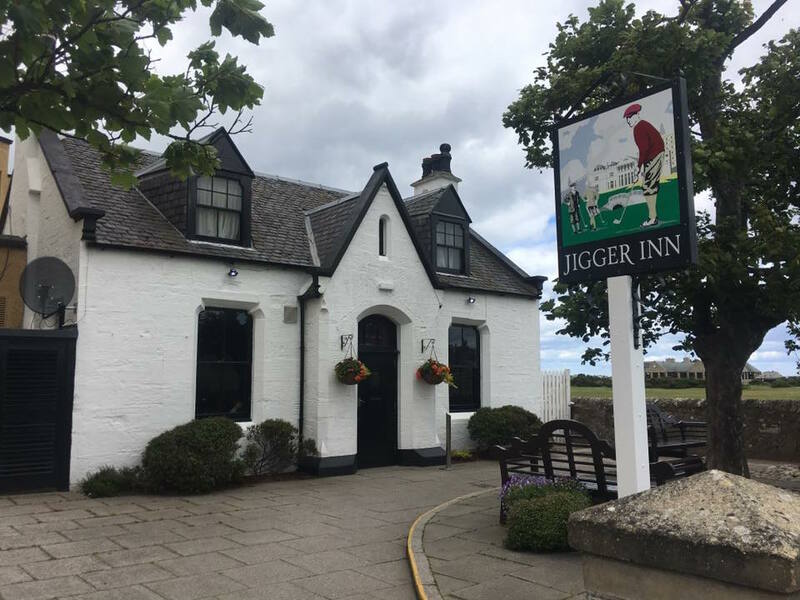 We had a lovely lunch at the Jigger Inn overlooking the 18th hole of the Old Course. Gemma and Craig from Two Scots Abroad joined us. The Inn is part of the Old Course Hotel and used to be the stationmaster's lodge, built in the 1850's. It's a traditional pub with open-hearth fires, dark wood and golfing memorabilia and they even sell their own Jigger's ale. We were unable to indulge though as we would need our wits about us for our final adventure. 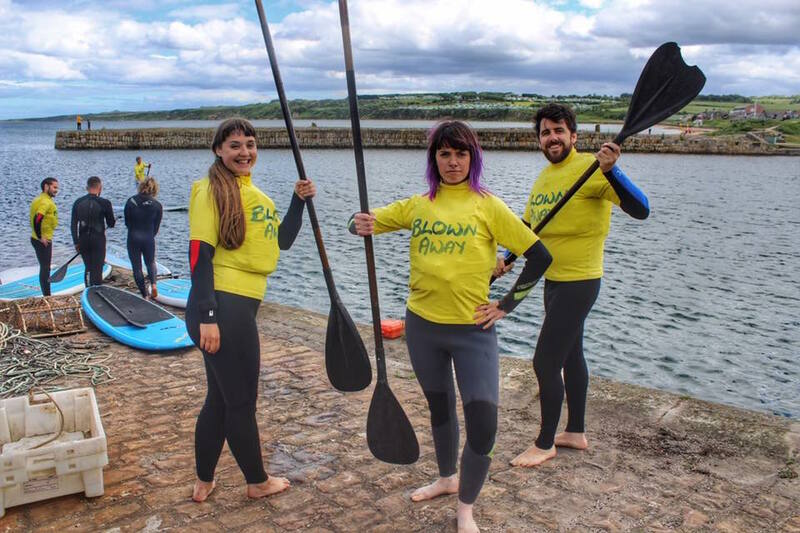 The Blown Away boys offer land yachting on West Sands beach which I've been meaning to do for forever, but I had no idea they also did paddle boarding! The wind had picked up so instead of going out to sea we headed to the harbour for an altogether more relaxed paddle. Choosing instead to take the photos I snapped away as the team donned their wetsuits and tentively crawled onto the boards. Soon finding their feet (and balance) they were off, and it looked idyllic. It was the perfect end to a fantastic weekend exploring Fife outdoors. It's amazing how much fun can be had without having to travel far.